​June 16 1968 was a red-letter day for Christians in the Milson area of Palmerston North. The first Combined Church service was held and an official Joint Use Agreement was signed by clergy from the three participating churches: St Peters (Anglican), St Paul's (Methodist) and St David's (Presbyterian). Since then, as the church has grown, people of many other denominations have joined in the life and worship of Milson Combined Church. Before this the Presbyterian Church had purchased a large old house and land in Milson Line, which was subdivided into Purdie Place (named after the St David's Minister Rev. Ian Purdie). The Anglican Church also owned a section in Milson, and the Methodist Church a converted garage where they held services. They proposed a joint effort, and each church put $2,000 into a building fund. The old house soon became too small, and sheds were added. Then in 1976 the City Council wanted the site for the Milson shopping centre, so the church House was shifted across the road to its current site. ​More space was still needed, so a new Hall was built, opened in 1980 in an occasion of great rejoicing. The Hall is used for our congregational services, and has been in constant use by a wide range of community groups and outreach programmes, including Girl Guides, Women's Institute, and Line Dancing classes. ​The Green Room because of the green carpet. Since all our pastors have been part time, we have developed a system of having Worship Leaders from our members to give continuity. Church members and visiting preachers provide ongoing ministry. This shared responsibility has developed into the Church Service tradition. MCC's first Minister (1972-74) was Rev Enid Bennett (Methodist) who passed away in 2006. 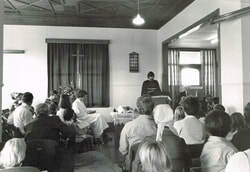 After a summer ministry in Milson in 1976, David Hercus (Presbyterian) returned to work half-time in 1977, as his first parish. In 1980 David left to become a Catholic priest! Methodist Presbyter Amos Burrough served in Milson till he retired in the mid 80s. ​spending far more hours in pastoral work than they were paid for." Graeme Mansell [lay pastor], and his wife Janet, "were both a great asset to the church, especially in their ministry to young people. Graeme also had great musical ability and church services became enlivened with modern Christian songs." Graeme left Milson in 1991 to train for ordination. He was followed by Anglican priest David Kettle, also a keen musician. David & his wife, with four children, came to Palmerston North from England. David also worked part-time as a University Chaplain at Massey. After David Kettle and family returned to England (where David has since died), Milson Church struggled to find another minister. We were delighted when Janice Lyon was appointed from All Saints Anglican Church. Janice was a lay pastoral worker. She trained for ordination during her time at Milson. She and husband Russell, were much loved and very successful leaders of the church. They established a preschool music group (Twinkletoes) and the Friendship Centre for older folks. After a decade of ministry at Milson, Janice finished in late 2010. Stuff: Purdie Place is Silvia's place – in the mysterious way life often works out. Reverend Silvia Purdie is the new minister at Milson Combined Church in Milson's Purdie Place. The street is named after Ian Purdie, the great uncle of Mrs Purdie's husband Chris. As minister of St David's Presbyterian Church in Terrace End, Ian Purdie was instrumental in the purchase of the Kidd property in Milson in the 1960s for a new church. In June 1968 the Presbyterians, Anglicans and Methodists combined to form the Milson Combined Church, two days after Mrs Purdie was born – so she is almost exactly the same age as the church. Each denomination has a decade turn supplying a minister and Mrs Purdie has replaced Anglican priest Janice Lyon. Rev Silvia Purdie (Presbyterian) commenced ministry in March 2012 and served until Sunday 6th December 2015. Silvia came from a youth and children's ministry background, and had been ordained into the Foxton-Shannon Co-operating Parish. With husband Chris [an army Chaplain] they have three teenage boys. While Silvia ministered at Milson, Chris was assigned to various areas of service including Linton, Ohakea and Vanuatu. When Chris was assigned to Christchurch, Silvia moved on from our church. On March 13th 2015 Peter Blake [retired] was commissioned by Rev. Stuart Goodin, Archdeacon of Manawatu and Wanganui Archdeaconries, to be our part time lay supply minister. Before becoming our Pastor, Peter was well known to our congregation, having been a visiting preacher for many years. Since finishing his ministry Peter rmains on our preaching roster, and he and Fran continue to visit when Peter has a sermon to deliver. ​David Donnellan was welcomed as our Lay Supply Pastor (12 month contract) on 12th February 2017. Since leaving David continues on our preaching roster bringing quarterly messages. Our current ministry is run by our Church Council with Les Boyd from our congregation bringing the message quarterly and visiting preachers serving all the other times. Irregularly we meet at other churches. Rongotea St Luke's is one we meet with for our Missions Sunday. In 2019 Missions Sunday will be held at Milson 26 May. Guest preacher will be Dr Mark and Mrs Faye Griffiths who serve at Danja Hospital in Republic of Niger.